In the past, the construction of sacred buildings was often linked to a supernatural event, such as sacred visions or miracles of different kinds. The Church of Santa Maria dei Miracoli was built at the end of the 1400s to house a painting of the Madonna and Child cherished for its miraculous powers. 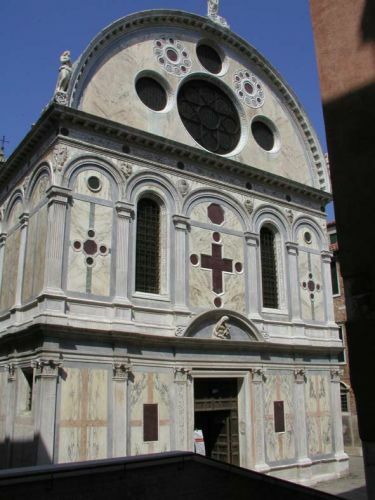 The church is a masterpiece of early Renaissance architecture in Venice and is often likened to a jewel box due to its precious marble façade, a favorite of Venetian brides. A short distance from the church is campo San Giovanni e Paolo, encompassed by imposing buildings. This elegant campo is the site of the Scuola Grande di San Marco (now the city’s hospital) and the Gothic Dominican Church of San Giovanni e Paolo, which contains works by Giovanni Bellini and Veronese. In the square in front of the church is the equestrian statue depicting the mercenary captain Bartolomeo Colleoni, designed by Verrocchio, Leonardo da Vinci’s master.